Throughout the centuries to modern day, fashion has been placed into categories. Although most designers’ work is idiosyncratic and, therefore, unfairly categorized, it is still important as fashion lovers to study these categories, their influences, and how they will impact the future of fashion. Listed below are only but a few of the styles of dress categories. ANDROGYNOUS: Indicating gender neutrality in clothing and silhouette, androgynous fashion is particularly associated with twentieth-century modernism. Clothing has become interchangeable between the sexes: for example Yves Saint Laurant’s Le Smoking Tuxedo of 1967 and the men of glam rock. The sexual androgyny of Marlene Dietrich and David Bowie typified androgyny. AVANT-GARDE: Standing apart from the mainstream, avant-garde is progressive, individual, and changes ideas. Some elements of the design are adopted more widely and the idea itself becomes mainstream. However, avant-garde may refer to a particularly unusual or extreme creation where form is given precedence over function. 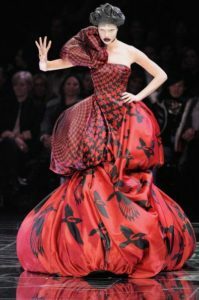 Many of Alexander McQueen’s runway collections could not be practically worn, but were incredibly beautiful. The aim is the present new concepts by challenging the conventional notions of how a garment is meant to function or look. BAROQUE STYLE: Baroque fashion takes its inspiration from the formalized excess of absolutist of the seventeenth and eighteenth centuries, especially at Versailles. It is characterized by historically inspired tailoring in decadent silks or heavy brocades, with lavish embellishment. 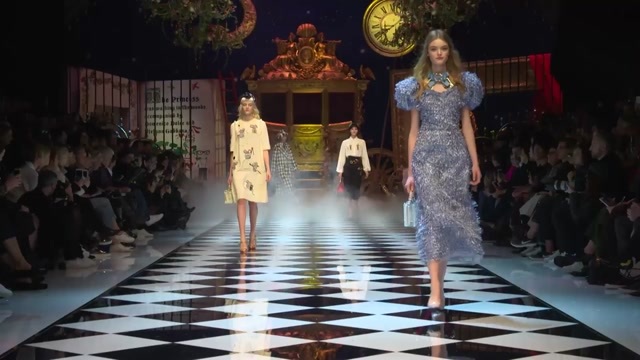 For fall/winter 2012-2013, Dolce & Gabbana offered the Baroque Romanticism collection which reflected Spanish Golden Age styles: black, heavily textured capes festooned with embroidery and contrasted with jewels. Vivienne Westwood’s Les femmes ne connaissent pas toute leur coquetterie in 1996 was directly inspired by Watteau and robes à la française, with classic silks contrasted with more iconoclastic tartans and bare shoulders. 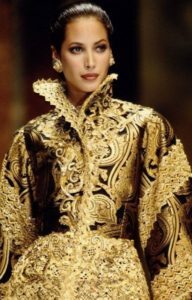 HAUTE COUTURE: Born in nineteenth-century Paris by British couturier Charles Frederick Worth, haute couture reemerged after World War II under Christian Dior and Hubert de Givenchy. Their elegant fashion houses showed biannual collections and had ateliers where garments were hand-sewn. Couture garments are developed from sketches are draping cloth, but their designs must be original. They will be ordered by individual client and will never be reproduced by the House. MINIMALISM: Minimalist designs rely on a simply cut clothes with an absence of detail, print, or embellishment. Late 1950s designs by Balenciaga and Givenchy included shift dresses and pilgrim pumps that exemplified a very feminine minimalism. These fashions were worn by Audrey Hepburn and Jackie Kennedy. Modern day 1990s minimalist designers include Jil Sander, Ann Demeulemeester, Calvin Klein, and Helmut Lang. These designers offered unembellished, yet beautifully cut items in noble fabrics. The Prada tote bag has become an icon of minimalism, in plain but recognizable Pocone fabric. READY-TO-WEAR (Prêt-à-Porter): Ready-to-wear indicates the more affordable yet still design-led end of fashion. It developed in France in the 1960s and 1970s when Yves Saint Laurent split from Dior to launch his own Rive Gauche Boutiques. It reflected a world in which customers no longer had time for individual fittings, but wanted distinctive, quality, ready-made clothing “off the rack”. This model was followed by the top fashion houses where haute couture remained the flagship activity, but prêt-à-porter became the more lucrative output. RESORTWEAR: Originally marketed to a post-war international jet set who could enjoy a year round summer lifestyle, resortwear is inspired by the Mediterranean and its traditions, especially visually. It originated on the French Riviera in the 1950s and the daywear collections of Emilio Pucci and Chanel, as worn by celebrities such as Jackie Onassis and Bridget Bardot. Clothes must be suitable for leisure and more relaxed soirées and suggest a casual elegance using lightweight fabrics. It also includes deluxe swimsuits, fitnesswear, and accessories. Brightly colored and nautical prints are prevalent. Many brands now offer a resort runway collection. 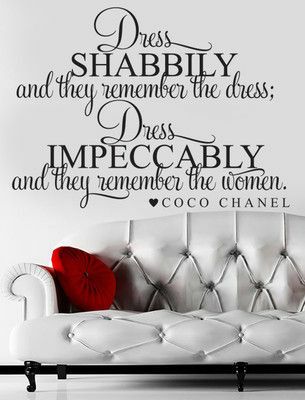 I love the Coco Chanel quote. I like the Baroque style. It looks so glamorous to me. I didn’t know the names of all these styles. It’s very interesting. 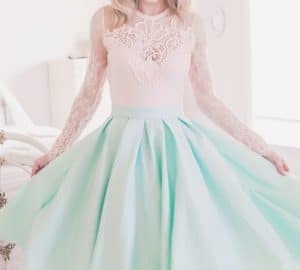 Thank you for breaking down the different styles of dress! Great summary of various fashion styles – Enjoyed the photos as well! Awesome breakdown! Loved the photos of the various styles. Thank you for the summaries of the different styles. I am not a fashionista but I want to be able to understand a little of it. I love Haute Couture and Ready to Wear! Love all of these looks! I especially like the minimalist look! I love this summary! So informational. I love fashion and just learned a few things!